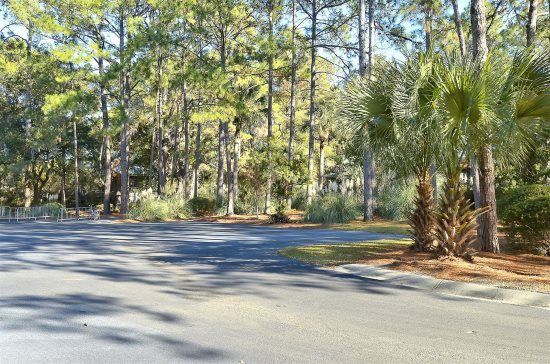 2 bedroom, and 2.5-bath Ocean Breeze townhouse, near Coligny and the Beach! You are only 1 block from beautiful South Forest Beach when you stay in this end unit, 2 bedroom, and 2.5-bath Ocean Breeze townhouse. The foyer leads into a bright dining area, a table for four, with abundant light from the large double windows. 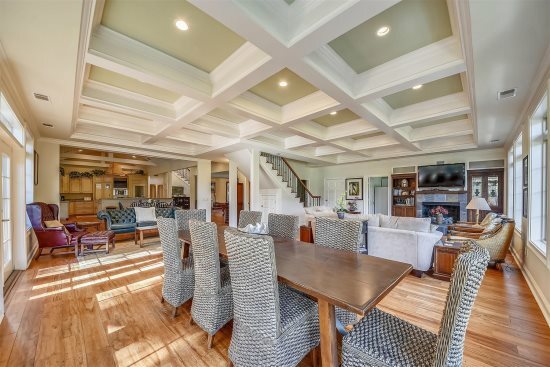 The adjacent kitchen is fully equipped and features an open circular breakfast bar, that overlooks the family room. 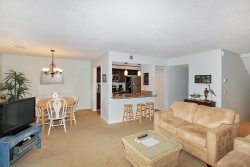 The family room is comfortably furnished, with TV//DVD, and a wall of windows with a slider door to the deck. The deck, which has plenty of seating, is just steps from the complex pool. A convenient powder room is located on the first floor, as well. On the second floor are the two bedrooms and a closet with a stack washer/dryer. The master bedroom has a queen-size bed, a flat screen TV, three sunny windows, and a private bath. The second bedroom has two twin beds, a private bath, and triple windows that offer a landscaped view. The Ocean Breeze complex has a swimming pool that is open from April through October, free on-site tennis, and is only a short walk to the beach. All beach distances are measured from the center of the complex. 2 car passes are allowed per villa. Very friendly, prompt, competent, and attentive staff. sunset rentals has always provided pet friendly, clean, well equipped units. They provide a nice home away from home at the beach. Lots of towels,loved the washer and dryer and location was great. Furniture was modern and in good condition.